When friends and family tell me they’ve never traveled to Asia before, I typically recommend Thailand as their first stop. It’s a great introductory country to the region because it will likely cause little or no culture shock for Westerns. Tourism has been a huge part of Thailand for years, which makes some of the most stressful elements associated with international travel, such as communicating with locals and figuring out transportation options between cities, much easier (compared to a country with a nascent tourist scene like Myanmar, for example). 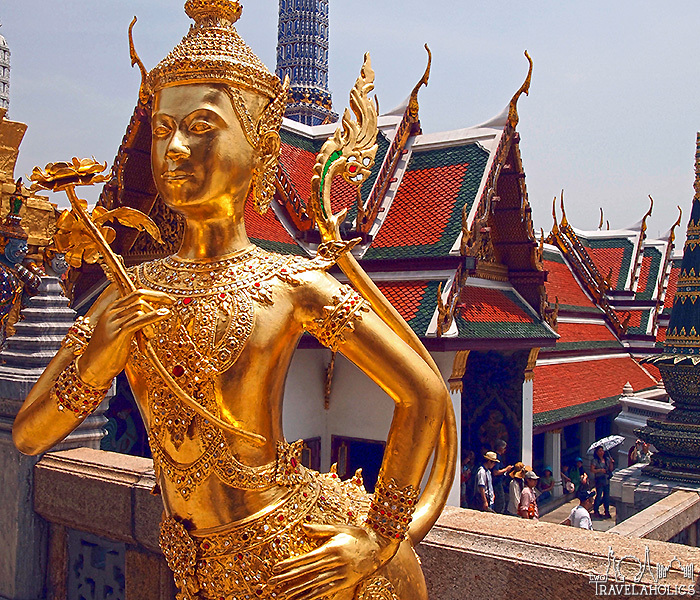 In fact, Thailand welcomed 26.7 million international tourists in 2013, which contributed 9% to the country’s GDP. 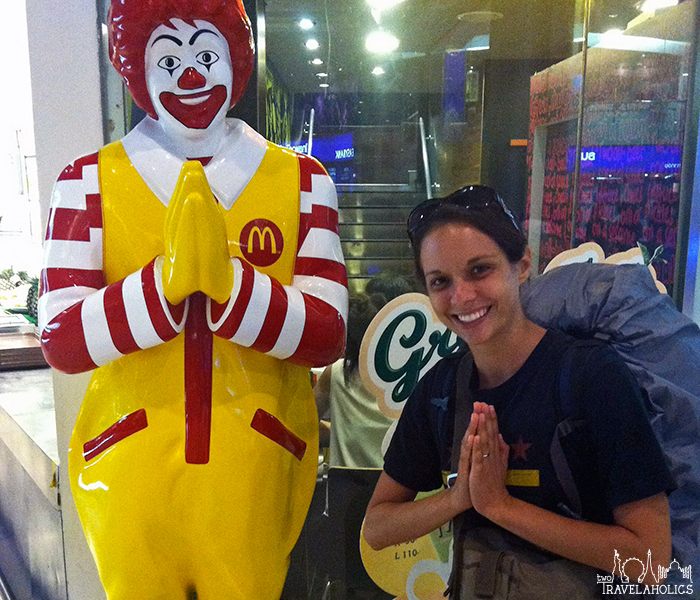 With millions of foreigners visiting each year, the Thais continue to support and expand their tourism infrastructure. 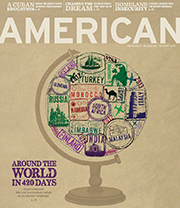 But when a destination becomes too popular – like Venice, Italy, or Siem Reap, Cambodia – many travelers voice what seem like the usual complaints, such as, “Some locals are dishonest and try to rip off foreigners” or “It’s just a tourist machine and isn’t authentic anymore.” To a certain extent, there is truth to this claim. Regardless of the country, as more money flows into a certain location, deceitful individuals may be attracted to take advantage of unsuspecting visitors. But while Thailand is not completely immune to this problem, it’s a large country that offers worthwhile sights and experiences that I wouldn’t pass up – or want you to. In fact, I could easily make the argument that Thailand has a little something for everyone. This tropical land of 67.7 million people has much to offer to visitors, from exploring Buddhist temples, to enjoying an inexpensive massage on the beach, to learning how to cook local food, to the debauchery that goes on at the Full Moon Festivals and along Phat Phong road. Do you want to explore ancient temples? Palaces? 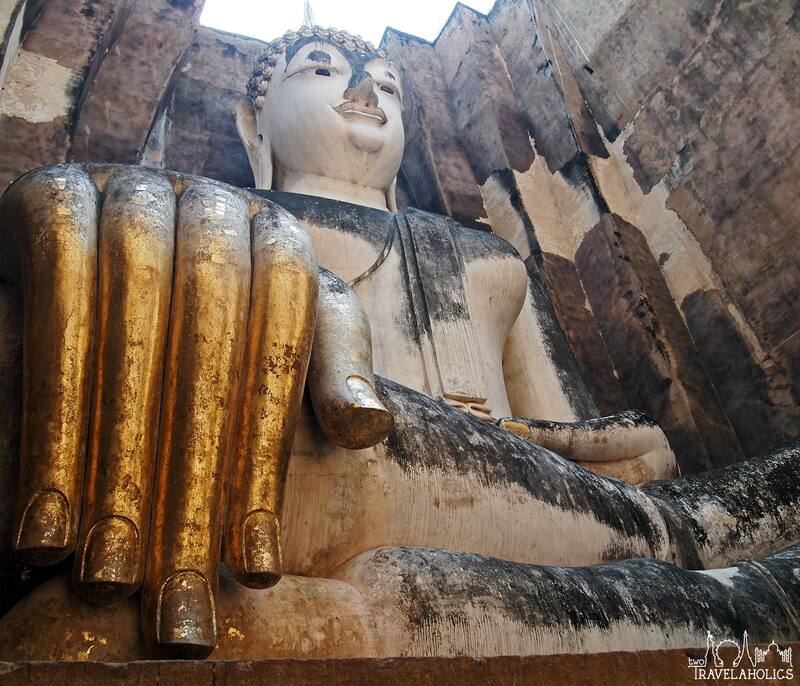 A larger-than-life reclining Buddha? A mall that was the most-Instagrammed location in the world in 2013? Tara at Siam Paragon Mall in Bangkok in 2013, the most Instgrammed location in 2013. If so, you can start your Thai adventure by flying into Bangkok, an East-meets-West metropolis filled with high-rises, Buddhist temples, multi-level malls, and buzzing tuk tuks. There’s no shortage of audible and visual stimulation in this city. 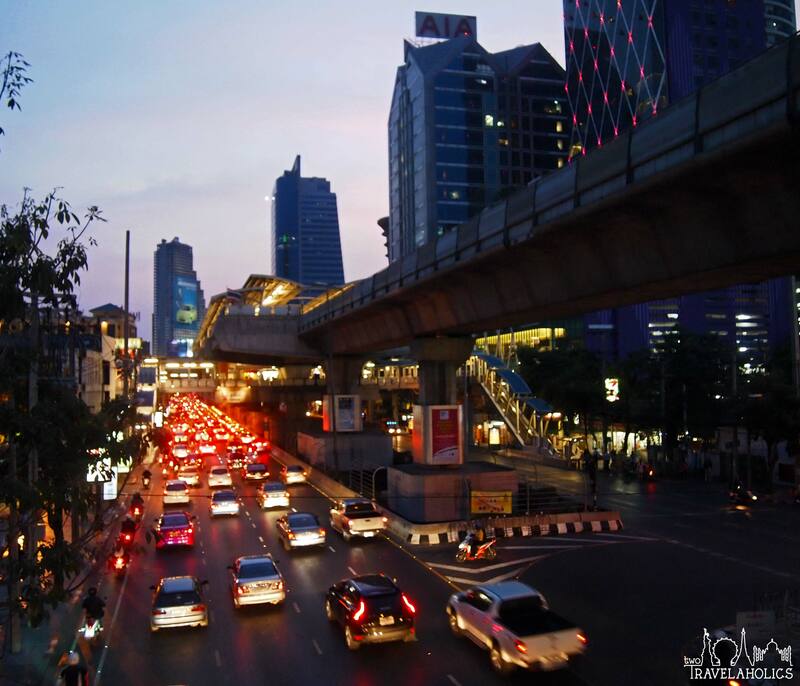 The bustling streets of Bangkok at night. Even cruising along the snaking Chao Phraya River on a public express boat will give you an awe-inspiring view of Bangkok and its bridges, including the modern King Rama VIII Bridge with its fanning cables. 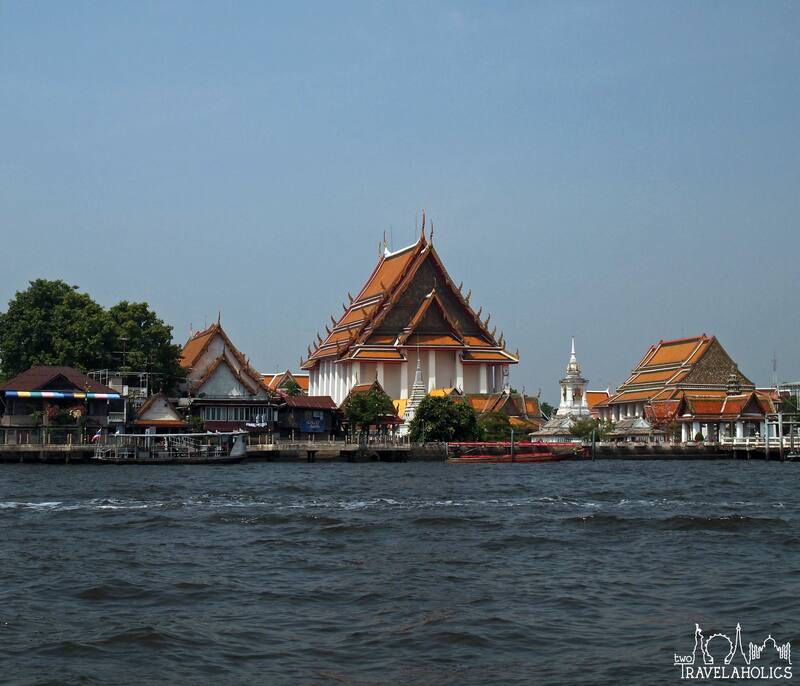 The express boat stops frequently, making it easy to hop off and check out Wat Arun, the Grand Palace, the 18th-century Phra Sumen Fort, or the 150-foot-long (46 meters) reclining Buddha at Wat Pho. View from the Chao Phraya River. 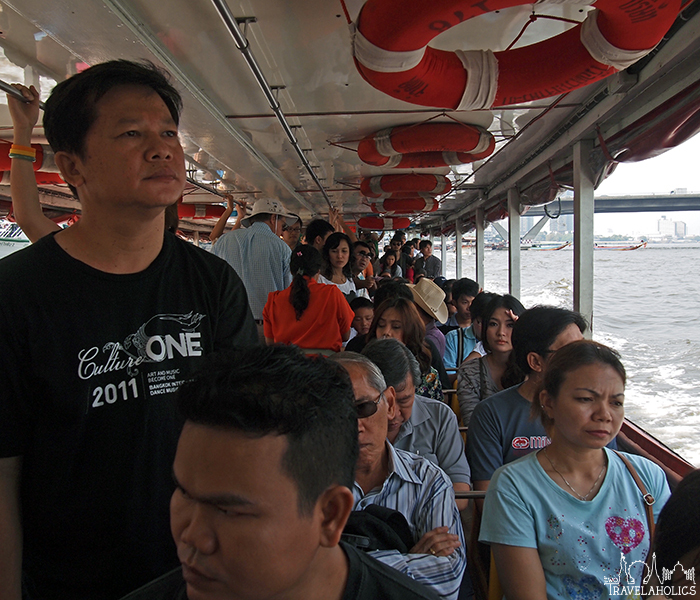 It gets quite crowded inside the Chao Phraya River express boat. If your sea legs aren’t too great and you’d prefer an air-conditioned ride around town, hop on the BTS (Bangkok Mass Transit System). The BTS’s lines don’t have stops everywhere you may want to go in the city, but it’s an inexpensive way to get around, or at least a little closer, to your intended destination. Its stations and the inside of the train cars are very clean and modern. And like most metro systems, it’s also great for people watching. The BTS does stop at the Victory Monument, if you’re into obelisks; at the Siam Paragon shopping mall, if walking around an enormous mall or seeing a 4-D movie appeals to you; and close to the Chao Phraya River at Saphan Taksin if you want to transfer to the express boat. Inside the walls of the Grand Palace in Bangkok. Thailand does have a lot to offer the architecture lover, but be warned – as you travel further outside of Bangkok, the local highlights are mostly ancient or modern Buddhist temples (“wat” in Thai). But the temples are indeed works of art, an important aspect of the Thai culture and its history, and definitely worth the trek around the country. 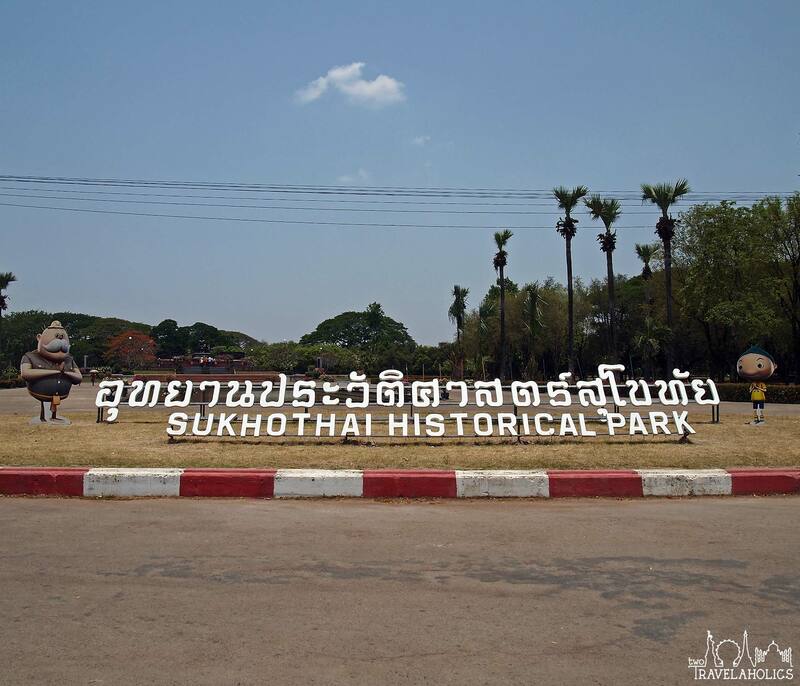 Wat Si Chum at Sukhothai. 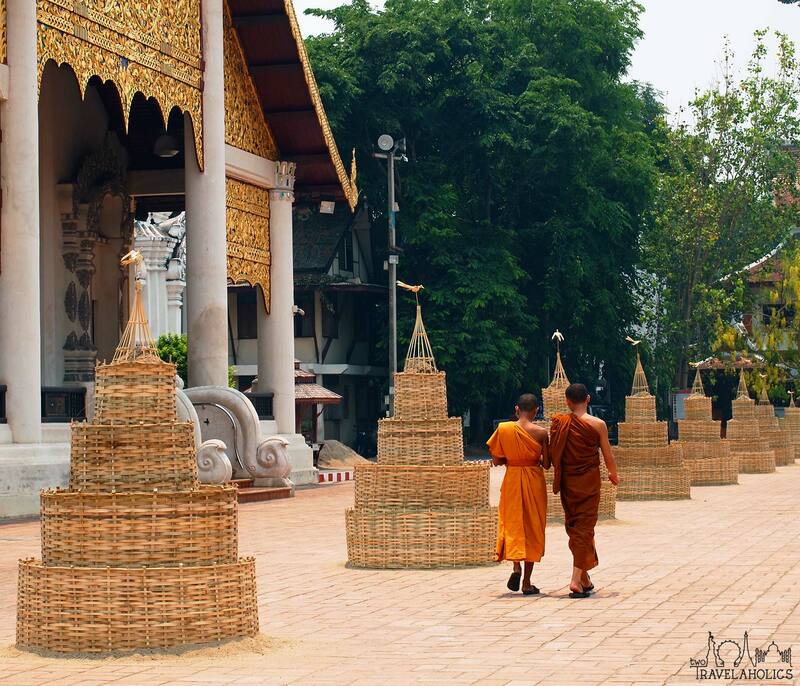 Your next architecturally and culturally significant stop will be Chiang Mai. (Travel tip: Buses were our main form of transportation around the country, as they are cheaper than flights and more reliable than trains.) The main sites within walking distance are located within the Old City walls, so you’d want to choose accommodations inside the walls or close to one of the entrances on the outside. 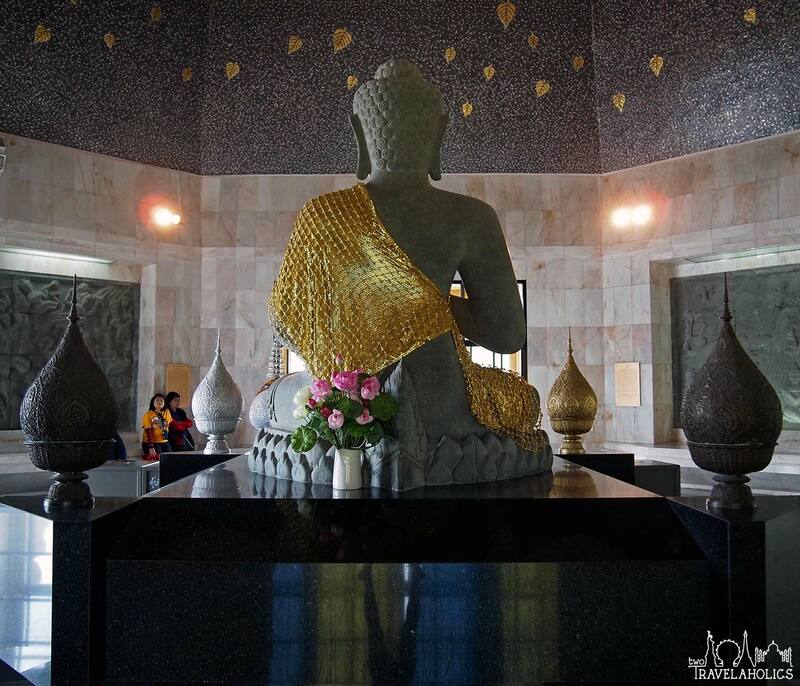 While in Chiang Mai, head to Wat Chedi Luang, which dates back to the 14th century. Before leaving this wat, stick around for Monk Chat, which is an educational activity where English-speaking visitors can sit and talk to the monks who live on the temple grounds. Doing this helps the monks practice their English, while also providing you with an opportunity to ask cultural or religious questions. 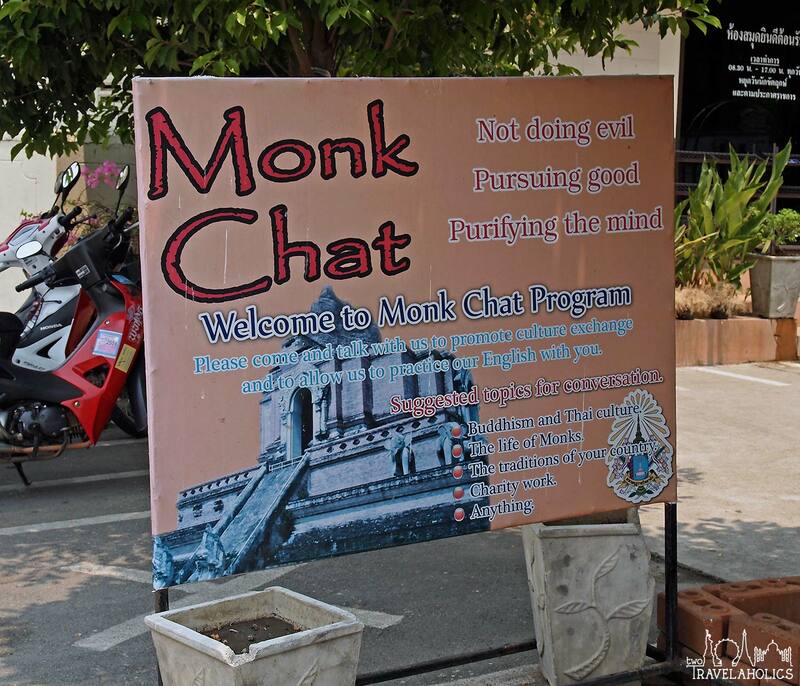 Sign for the Monk Chat at Wat Chedi Luang in Chiang Mai. Monks at Wat Chedi Luang in Chiang Mai. 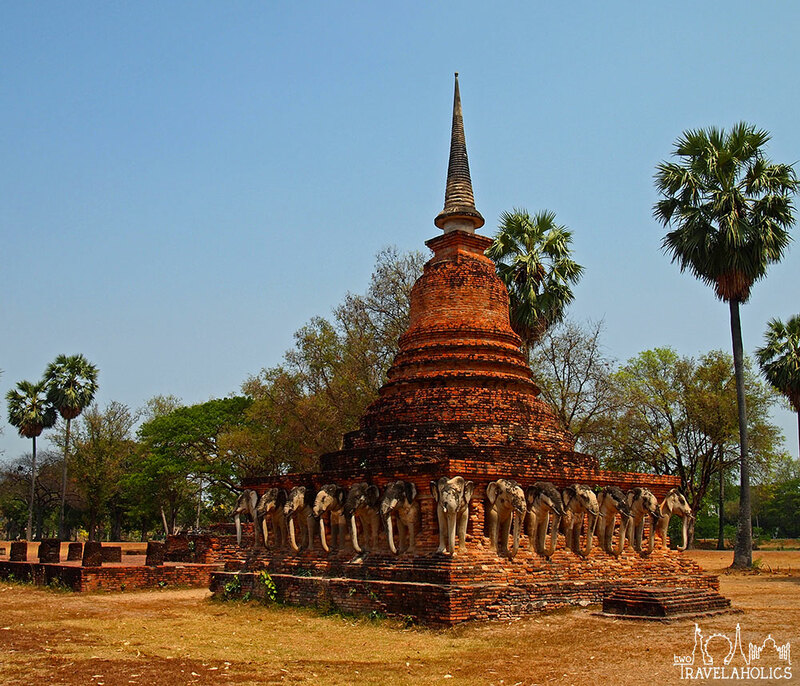 There are additional temples around the city, like Wat Phra Singh and Wat U-Mong, that you can visit on foot, by tuk tuk or by hopping on board a songthaew. Once you have explored Chiang Mai, you can venture to Wat Phra That Doi Suthep (about 9 miles or 15 kilometers outside of the city). 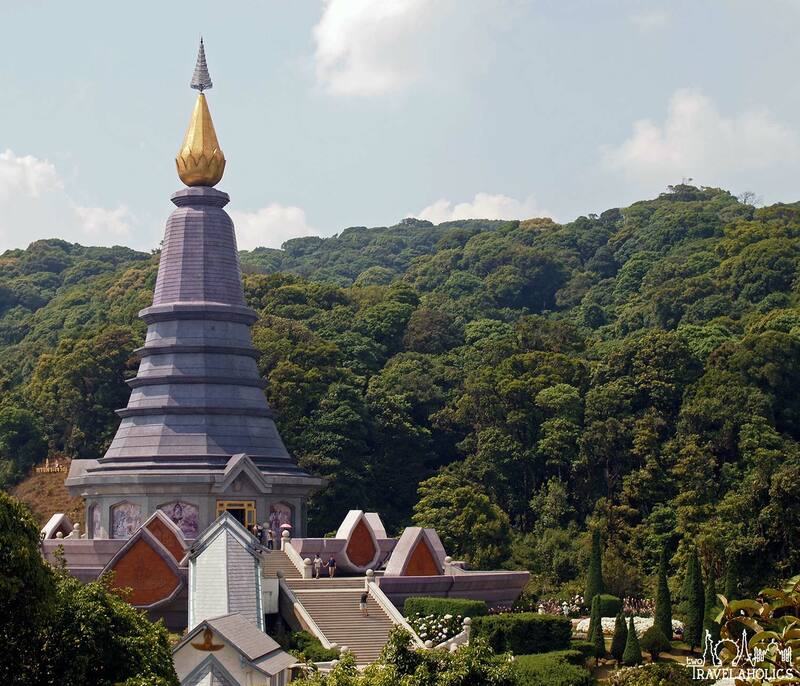 Another option is to visit the King and Queen’s twin chedis (their final resting spots) at the top of Doi Inthanon, Thailand’s highest mountain. 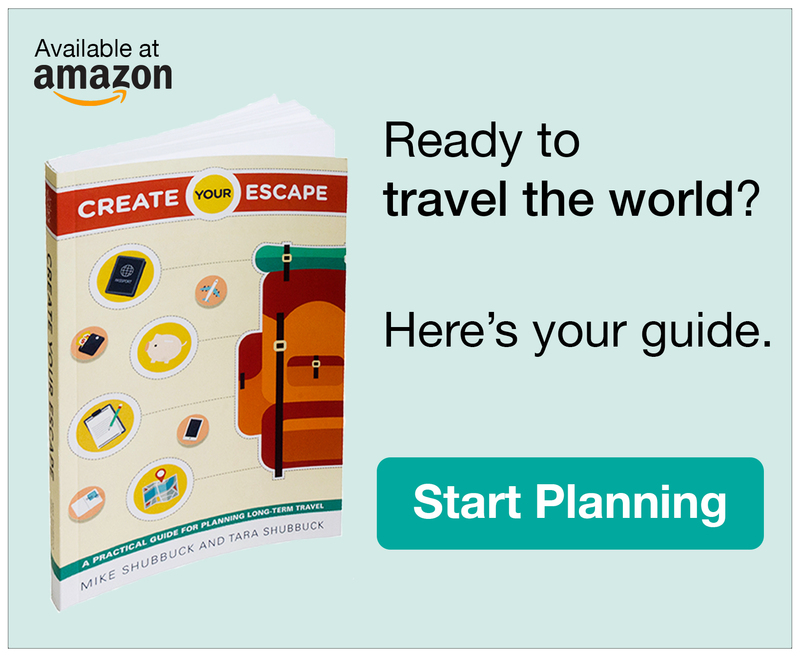 To get to either destination, you would have to rent a vehicle, hire a driver or join a tour. There are dozens of travel agencies and tour operators in Chiang Mai, so you should have no problem booking transportation to get out there. Be sure to shop around and negotiate costs no matter which option you move forward with. The Queen’s Chedi on top of Doi Inthanon. Inside the Queen’s Chedi on top of Doi Inthanon. Inside the King’s Chedi on top of Doi Inthanon. If you still have time during your trip, go further north to Chiang Rai, in what’s known as the Golden Triangle, where Thailand meets Laos and Myanmar. 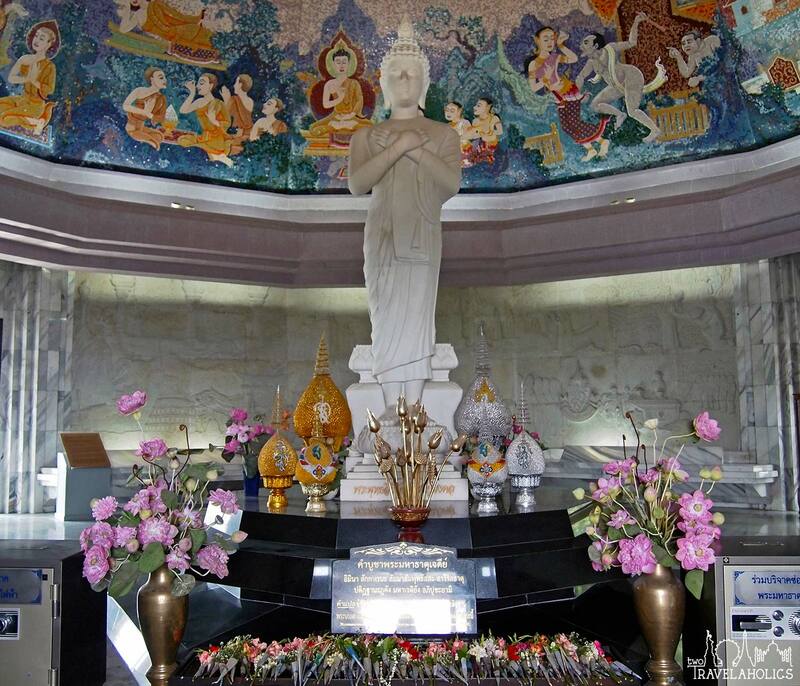 Here you can visit the idyllic white temple Wat Rong Khun. Chiang Rai is only a few hours’ drive northeast from Chiang Mai, so if you plan strategically, this could be a day trip. When visiting temples, always remember to act and dress respectfully. Do not wear shorts, tank tops, or ratty or see-through clothing. Your attire should consist of pants that extend to the knees or longer and shirts that cover your shoulders and do not expose cleavage or your stomach. Shoes cannot to be worn in or around a temple; you should opt for sandals or similar slip-on shoes so you don’t have to be bothered tying and untying sneakers. You typically leave your shoes outside the entrance, but you could bring them inside if you have a large bag to conceal them in (holding shoes while walking around is not allowed). 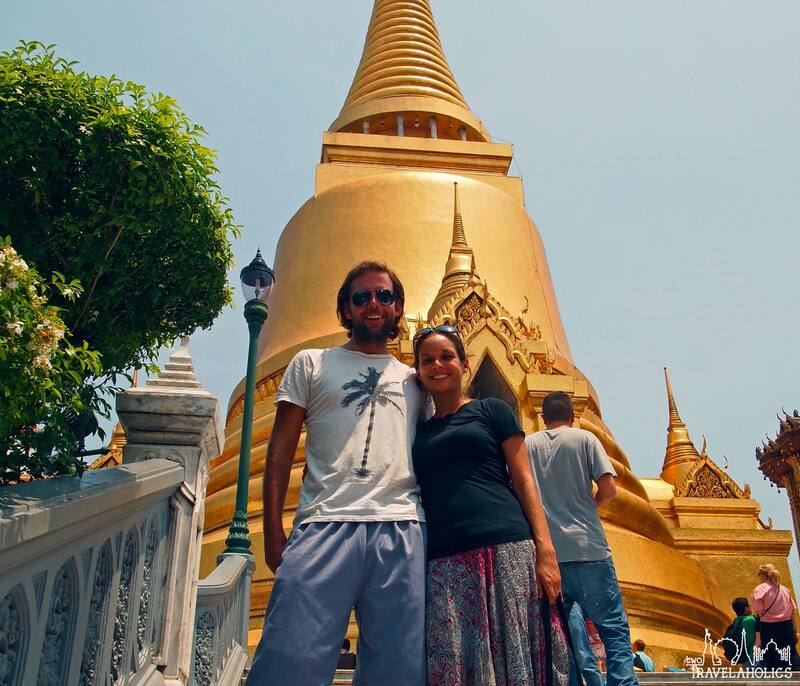 Mike and Tara wearing appropriate attire at Phra Siratana Chedi on Bangkok’s Grand Palace grounds. This aspect of cultural etiquette also applies to anyone visiting the Thai people in their homes, as many natives dress conservatively and also do not wear shoes indoors. You may get the opportunity to visit villages during a group tour or perhaps you’ll receive a personal invitation to someone’s home. Traditional homes are not like typical Western homes. Throughout the country there are variations of traditional stilt homes, which are an architecturally significant part of the Thai culture. Wooden stilts raise the house, which is typically made from wood and bamboo, to about 5 or 6 feet high to avoid floods and wandering animals. The space beneath the home isn’t neglected. In fact, it’s an important area in everyday life that is used in a variety of ways, like for storage, parking motorbikes, as a work area, a space to hang laundry, and a gathering place to eat, relax or socialize. 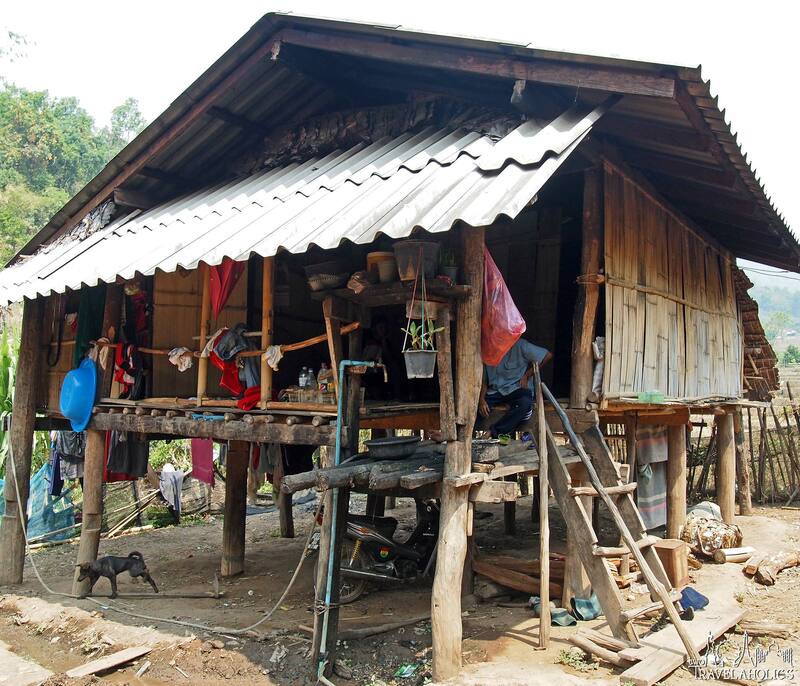 Traditional Thai stilt home in Northern Thailand. If this taste of Thailand has piqued your interest, be on the lookout for the next few posts in this series, which include Thailand for the foodie, the outdoorsy traveler, and the honeymooners. Thailand has a special place in my heart because of the experience w had there and how it changed me completely, I’d love to return one day. Thai architecture is surely very interesting and very different to what I’m used to coming from the Western world. I remember liking Sukhothai a lot and I now realize that even if somehow we ended up in Bangkok several times, I’ve never seen the Grand Palace from inside.. We travelled from the South to the North, by the point we were in Chiang Rai both me and Dale had seen so many temples that we were completely “templed-out”. Yea, the architecture there is what surprised me the most about the country. Before going, I had thought of Thailand as a beach destination. I never learned the country’s history in grade school, so I hadn’t previously known about the ancient cities and temples that we encountered. I’d love to go back and volunteer like you guys did. 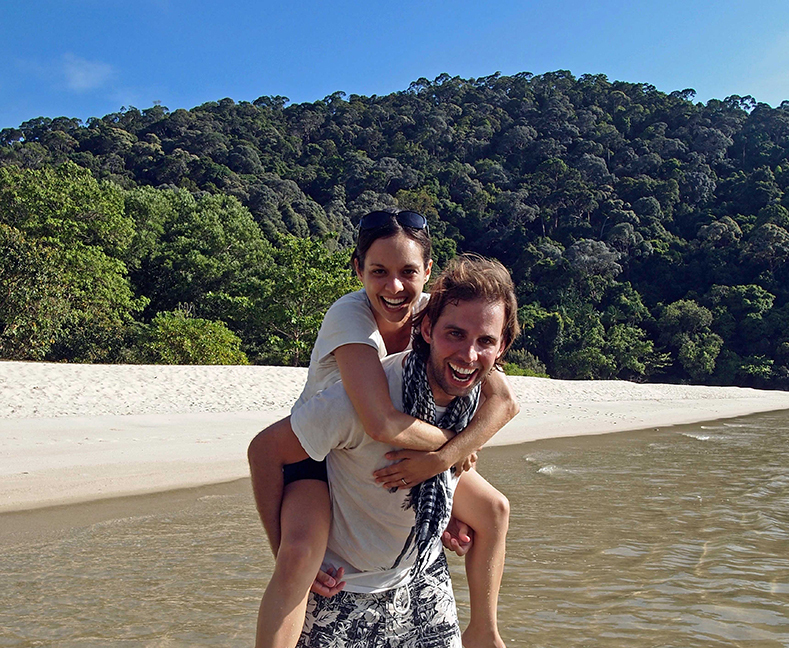 Like Couchsurfing, it probably gave you a different perspective on everything.